I would like to thank Netgalley, the publisher and Wendy Hinman for the ARC of “Sea Trials” by Wendy Hinman. Wendy Hinman writes about the Wilcox family which is her husband’s family . They planned to sail around the world in four years on a large Sailboat, “Vela”. Due to unforeseen circumstances it took five years. This was around 1973. Chuck and Dawn Wilcox and their two children made preparation to sail, gathered their passports , money,important papers, schoolwork, and whatever would be needed to start and complete their journey. Dawn . a Nurse, tried to have medications on hand, if needed. She arranged for her children to be sent school work at various ports. They were able to cook, and use electricity when they first started the voyage. The author uses notes, transcripts photos, and media to describe the journey. Each time the Vela sailed to another port, or country, their passports and papers were checked. The family would have to get to land to go to a Post Office. Of course this was a wonderful experience for the family, especially the children to see various people, cultures and traditions,as well as the scenic countries. Of course, this journey could be dangerous. Medical issues , such as food poisoning, Scurvy, broken bones, fevers, and more had to be handled. The sea and Mother Nature could be problematic with hurricanes, storms, winds,heat and cold. The biggest upset is when the sailboat hit some reefers and was shipwrecked. The family was lucky to find a house to rent, and tried to get to repair the sailboat. In the close proximity to each other, there were arguments. At times getting food was difficult. Also everything cost money, and as much as the Wilcox family planned, many additional expenses came up. In the 1970’s the political condition of the world was changing. Egypt and Israel didn’t get along, Leadership of countries changed. In some waters there was the threat of pirates. I found this book fascinating and intriguing. I know I get seasick on the ferry, so I can appreciate how this family wanted to live their dream, even though there were dangers. 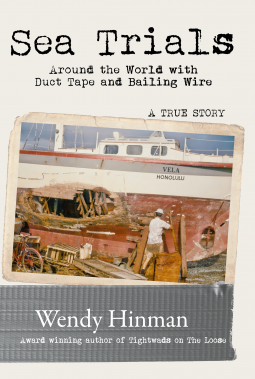 It is hard to believe that this is a nonfiction book, and I would recommend this to read about a great adventure.